Don't forget. 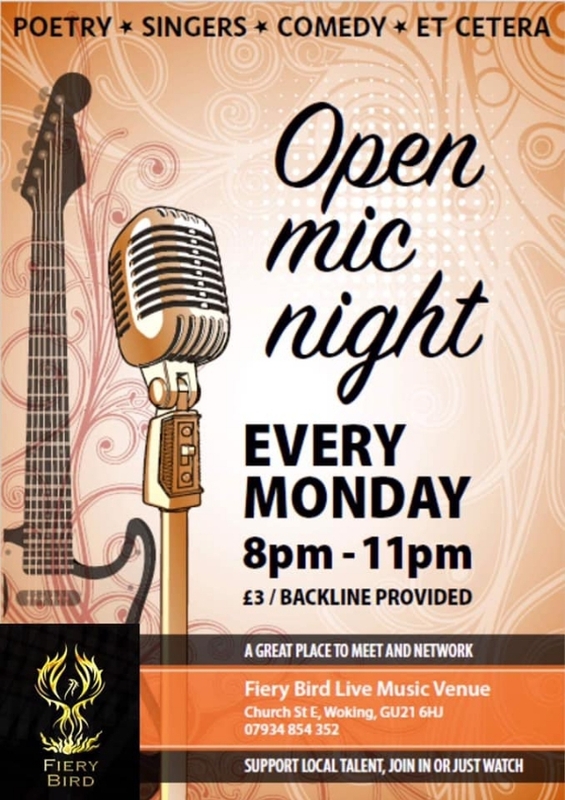 This Monday and every Monday (except bank holidays) is the Open Mic and Jam at the Fiery Bird Venue, 8-11pm. If you fancy booking a slot, drop us a message or just turn up. Minimum donation is £3 towards costs. PA, microphones, fully tuned piano, Cajon, amps, acoustic guitars, and electric bass all supplied. The Phoenix open mic is back by popular demand! Friendly atmosphere, with a chance for everyone to join in for a few songs! A community project bringing live music and other cultural events to Woking. 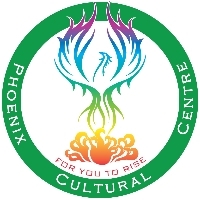 The Phoenix Cultural Centre is a social enterprise, working towards creating a welcoming and inclusive space where people from all backgrounds can enjoy and participate in music events and which supports other community groups working in Woking. We collect information about you when you voluntarily register to receive an email newsletter from us. 3. How will we use the information about you? We collect personal information about you to email you about our organisation, activities, events and news. We use information about your opening or clicking of email newsletters in order to understand your level of interest in our organisation and to compile aggregated statistics about the information we share. We use your information collected from the website only in an anonymised form and in order that we can understand how many people have seen or shared our information. - Our legitimate interests (if you are a member of our organisation, a volunteer, a registered service user, a customer, a trustee or similar). Please email or write to us if you need details about the specific lawful basis we are relying on to process your personal information. If you sign up to receive an email newsletter, we would like to send you information about activities and services of ours and perhaps other organisations which may be of interest to you (always sent by us in our email newsletters). If you have consented to receive our email newsletters, you may opt out at a later date. You have a right at any time to stop us from contacting you for marketing purposes. If you no longer wish to be contacted for marketing purposes, please either click ‘unsubscribe’ on the bottom of any email we send you, or email or write to us. We will get your express opt-in consent before we share your personal information with any third party for marketing purposes. Cookies are small text or image files placed on your computer to collect standard internet log information and user behaviour information. This information is used to track use of the website and/or emails and to compile statistical reports on activity. You can also disable tracking technology in emails you receive by adjusting your email service provider’s settings. Whatever the lawful basis of our processing, you may opt-out of our email newsletters at any time. Please either click ‘unsubscribe’ at the bottom of any of our email newsletters, or email us asking to unsubscribe. You may also request your personal information to be erased, or object to its processing. In both cases, please email or write to us. In order to turn off cookies, you may change your browser settings (for website cookies) or your email service provider settings (for tracking cookies in email newsletters). Please note that this may affect the way our emails or our website looks or performs. We want to make sure that your personal information is accurate and up to date. If your email address changes, please click ‘unsubscribe’ at the bottom of any previous emails, and re-subscribe here with a new email address. To report any other changes, please email or write to us. We share your personal information with a third party, Interests Media Ltd (trading as interests.me) only in order to process the sending of our email newsletters, and to allow them to analyse and improve the functioning of the websites they provide for us. In our contract they are not permitted to contact you directly or pass on your personal information to any third parties except as agreed between us in order to complete their contract. We may have to share your personal information with other third parties for legal or reporting requirements, such as with professional advisers, regulators, or other authorities. We do not transfer your personal information outside the EEA (European Economic Area). If our suppliers have a need to transfer your personal information outside the EEA, they do so in a way which meets criteria we have set out in a Data Processing Agreement with them, to ensure a similar degree of security of data as that provided by regulation in the EEA. We will notify you and any applicable regulator if there is a suspected personal data breach where we are legally required to do so. We will only retain your personal information for as long as necessary to fulfil the purposes we collected it for, if there is no legal, accounting, or reporting requirements to retain it for a longer period. We will place any updates on this web page. If you are unhappy with how we collect and use your data, please tell us first. You also have the right to complain to the ICO (Information Commissioner’s Office), whose website can be found at www.ico.org.uk.